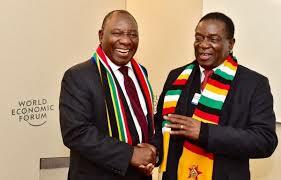 SOUTH African President Cde Cyril Ramaphosa is expected in the country tomorrow to discuss issues of mutual concern with his counterpart, President Emmerson Mnangagwa. President Ramaphosa, who is also the chairperson of the Southern African Development Community (Sadc), will also visit Mozambique on the same day. In a statement, the South African presidency said President Ramaphosa’s visit forms part of a long standing tradition in the Sadc region where newly elected Heads of State pay courtesy calls on neighbouring countries. “During the visit, President Ramaphosa and his counterparts will discuss bilateral co-operation as well as regional, continental and global issues of mutual concern. It is expected that the Sadc Heads of State will pay a particular focus on the latest political and security developments in the Region including the regional economic integration agenda in the Southern African Development Community,” reads the statement. The ANC leader was inaugurated as South African Head of State last month following the resignation of Cde Jacob Zuma. Last November, President Mnangagwa also paid a courtesy call on the then President of South Africa, Cde Zuma, following the resignation of ex-President Robert Mugabe.